Adult vaccinations are given on an annual schedule. Canine vaccines are administered subcutaneously. Vaccines include Distemper, Hepatitis, Parvo and Corona (DHPC). Rabies vaccinations are given either annually or every three years. Other elective vaccines available are Bordetella, Lyme, Flu, and Rattlesnake. These vaccines are boostered every year. Feline vaccines are given subcutaneously and include Rhinotracheitis , Calicivirus and Panleukopenia (FRCP). Rabies immunization is given either annually or every three years. Other elective vaccines available are Feline Leukemia (FELV), Feline Immunodeficiency Virus (FIV) and Feline Infectious Peritonitis (FIP). These vaccines are boostered every year. 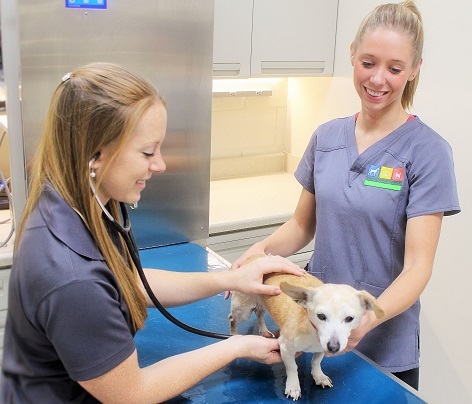 Because our pets age approximately 7 times faster than humans, we stress the importance of an annual physical examination, vaccines and routine wellness and geriatric blood work. Thorough check-ups and preventive care can help detect serious health problems. Routine wellness blood work includes a test to evaluate organ function. It tests for liver, kidney and pancreas functions along with a complete blood count that evaluates red blood cell and white blood cell values in the body. Thyroid function is often evaluated if symptoms like overweight, dermatitis and intolerance to cold are noticed. Urinalysis is required at times to evaluate kidney function. Many other tests are available to further diagnosis conditions depending on the basic test results and symptoms presented.